Once again, Tom & I have returned, safe and sound from a trip . I no longer call them vacations as every day is a vacation in retirement. This time we chose a bus tour to England and into Scotland long enough for Tom to see his brother and an old friend. We landed at Heath Row airport , were met there and taken by bus into the heart of London where we were billetted in a lovely hotel, right in the heart of things. Oxford Street ,Piccadilly, Regent Street and Park, Buckingham Palace, Hyde Park all within walking distance so we did a lot of walking to see all we could. From London we drove south nearly to Southampton, west and north to Stratford, and the Lake District, into Scotland and then south to York area and back to London. We saw Churchill’s birth place, Blenheim Palace. A magnificent building in a formal garden , much like Versailles in France. He was born here, home of the Dukes of Marlborough ,by chance as his mother was visiting. They have set aside several rooms with memoribilia about Chruchill which I found very interesting as it is about some one who I remembered. Letters to his father, from his school, amused me as he was asking for money—some things never change ! Medals and his many uniforms were on display as well as his family history. We also saw the house he bought,Chartwell, for 5000 pounds, and lived in until his death. During the war he had to move as it was felt it was not safe as was very near an active airbase. When he lost his seat in Parliament he could no longer afford to keep Chartwell up as he had a place in London also. Some of his wealthy friends purchased it with the understanding that he could live there the rest of his life and then it would go to the National Trust, therefore it is open to the public. It is a “liveable” house, large but not like a mansion or castle. The grounds are large, two lakes and a large swimming pool, shrubs,flowers, trees of every description . In one lake there were black swans which were a gift from the Australian government.Churchill loved this place and did a lot of the work himself. His studio, where he painted, was on the property with many of his fine paintings displayed. To finish up the Churchill sage we also saw the place where he is buried, in the family cemetery. Beginning to end, a fasinating story of a very famous man. A National Motor museum—-interesting even to me!, a Cistercian Abbey ( these poor monks had to pay a pound to the King and as they had no way of making money, they very often could not pay so lost their Abbeys),James Bone exhibit, Winchester Cathedral, Avebury (where there are stones in a circle, but much larger than Stonehenge),Shakespears birthplace and town, houses where Anne Boleyn and Catherian Parr lived. As you know, these were two of Henry VIII’s wifes and he sure went through them—–2 divorced, 2 beheaded, 1 died and 1 survived !, 200 year old Iron Bridge where the industrial revolution started, Wordsworth’s grave, Edinburgh, Castle Howard (fabulous gardens), Hadrian’s Wall and York Minster were some of the highlights of our trip. The scenery was wonderful, rolling hills, stone fences as far as the eye could see, multitudes of beautiful flowers, little villages along with the peaceful scene of sheep and cattle grazing in the rural setting. We always have an adventure and this time was getting lost in Hyde Park London. Against my better judgement we took a wrong turn and ended up in Hyde Park, without any idea of where we were going, just at dusk. All I could think about was a film we had seen many years ago of this couple from out of town (called the Out Of Towners !) who were lost in Central Park New York for the night and all the disasters that befell them ! Sure glad to get out of there and back to the hotel. Then I got lost in a castle—now that was scary as seem to be no one around and I went through a long hall and up a LONG staircase before actually seeing a human being. After all the statues and horrible paintings I could have kissed the first person I saw. After that I just looked for the exit and got out as fast as I could. We also got soaked to the skin in both Edinburgh and London, but no ill effects. All our accomadations were excellent, especially the one in the Lake Distict. We opened the door and entered a suite, a large four poster bed in a large room, from there we stepped out into a semi circle room , all windows with two comfy chairs and a table looking over the two and Lake Windermere, a view to die for ! up a few steps was a turret room with couch, table and TV, a private viewing room, all to ourselves. Tom wanted to go to the desk and ask if we were in the right room, but NO way as in the 30 some years we have travelled its the first time we have ever had a view worth looking at. We were the envy of the whole bus! Meals were good, a full English breakfast was offered every morning, but we mostly stuck with what we eat at home. Lunch was on our own also some dinners. One place we were at was out in the country with no signs of restaurants, but we were told that 5 minutes down the road there was a pub that served meals. So off we went, only to find out that they didn’t, but one man was good enough to tell us that just down the road a bit further we would find pubs. Off we went again and 35 minutes later we walked into a pub, only to be told that they would be starting to serve meals the first of October. Tom said, “We don’t have time to wait” , and away we went again, but did not have to go far this time. The service was so slow in this one that it was nearly dark before we got back to the hotel—along a country road with narrow roads—-well, if we didn’t have these adventures what would we have to talk about ! In Edinburgh , Tom was very pleased to see his brother. We had supper with him , only spent a few hours as could see he was getting tired (he has had a stroke and rests a lot). Tom’s school chum took us for a nice long drive through Edinburgh and surronding area, all the while keeping up a running commentray of his and Tom’s exploits, they were no angels . Had dinner out and then back to their home for tea and sweets. In London we were able to meet with Tom’s grand daughter, Nicole and had lunch and dinner with her. She took us on a walking tour of her neighbout hood and to her apartment. A very enjoyable time with a very lovely young lady. So, on my way to “everywhere” I saw another part of Britain, we are already thinking of where to go next. Just 6 days after arriving home from Europe, Tom and I flew out to Calgary to house and dog sit. Tom’s son, Rob, and his wife, Debbie, were going on a Ride for Cancer, from Calgary to Austin Texas. The weather was like summer, which was good news to Calgarians as their summer had not materialized. Fish Creek Provincial Park is just near Rob’s house so was close by for walking. This Park used to be a large ranch, along the Bow River, the ranch house is still there and there is an information building near by. There is also a nice cafe, Annie’s but was closed for the season.This park is very extensive, a pristine nature reserve. There are picnic sites, info centres and walking trails. Many wild life are often sighted in this park and it is a common thing to hear the coyotes. Beavers are busy and have made many dams along the river. Tom used this park every day for the three weeks we were there. I was not so ambitious but did enjoy the walks I did. I would walk to the top of a hill where there was a bench and from there I could see the Rockies and a large expanse of Calgary. We had two of the cutest little dogs to look after. Satchmo and Paris. As they were used to sleeping with humans I got to have them in my bed. At first I was sort of reluctant as I never even let my children sleep with me! but after a few nights it was nice to have them snuggle close to me. Debbie tells me that Satchmo is still going towards the bedroom I slept in, good to know I am missed! Three cousins live in Calgery, one I had not seen since 1979. She is a step-cousin as her mother and my step-mother were sisters. Tom and I spent a nice evening with her and her husband. Judy and Norman McCallum picked me up , had lunch and then Judy and I went to visit another cousin, Emily Boyle. It was nice to see them all. On Oct 26 we finally made it home again and although all the travelling was very nice we were glad to be back home and into the old routine again. Of course we are already looking for another trip in 2011. Back in Burlington after three weeks in Calgary—that is for another day as want to keep on with our trip to France for now. Gerry took us out to some interesting place every afternoon. 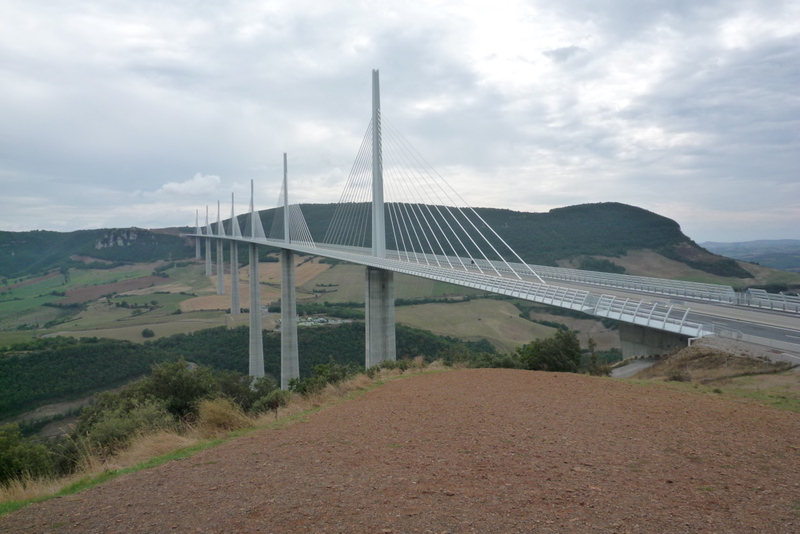 One day we drove over the Viaduc Mileau, the highest bridge I have ever seen and when I would look at pictures of this bridge I said to myself that no way on earth would I ever go on it! It is Southern France and one of its spans is almost as high as the Eiffel Tower, very spectacular. 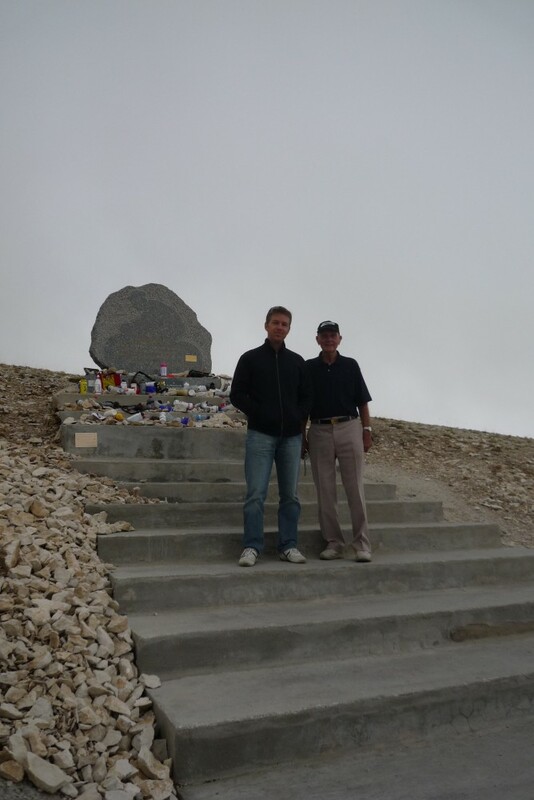 We drove on to Mount Ventoux where the Tour de France goes every two or three years. We saw several cyclist going up and down.Going up is a struggle but going down must be terrifying. Even in a car I found it hair raising so can not imagine on a bike !! 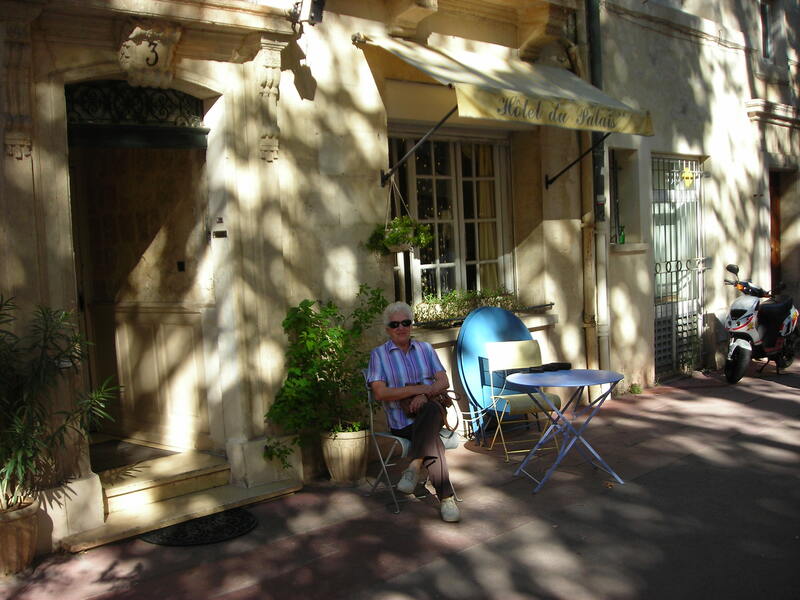 After four nights in Montpellier Gerry moved us to Nimes, where he lives now. It was the last day of a Bull Fighting Festival and Nimes was still full of people and very loud music. Had supper at Gerry’s and then home to bed but it was too noisy for much sleep. The next day all was quiet and a lot of cleaning up to be done after the party. 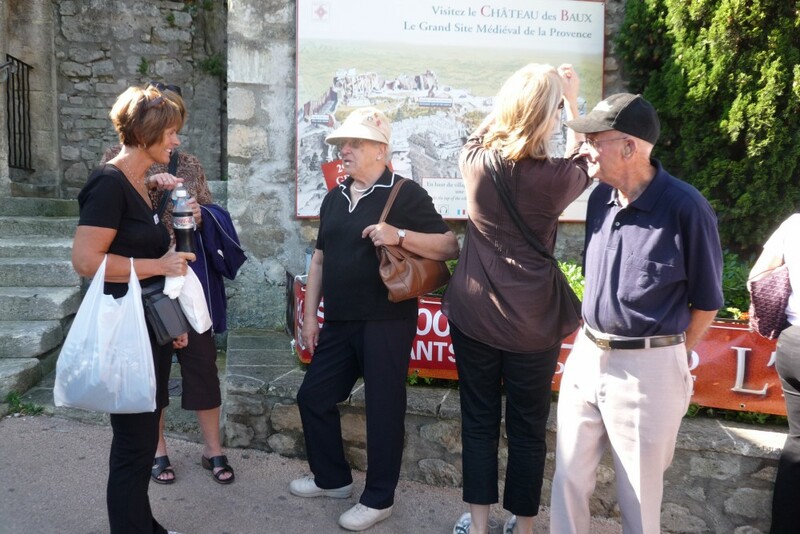 Drove to Les Baux, a very old village. Met a lady from PEI who knew my brother’s restaurant. Small world! 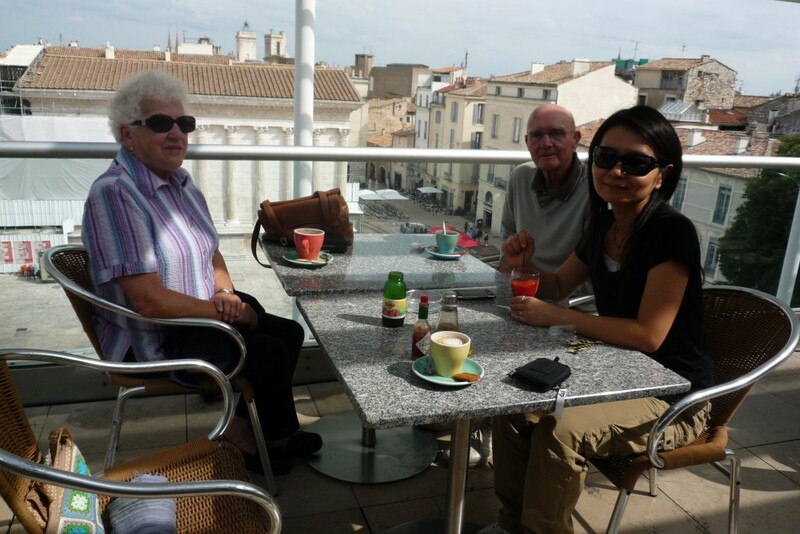 One day, after a stroll around old Nimes we went to the top of a library building and had hot chocolate, eating out side like the natives, felt very French ! That evening we were invited to Gerry’s land lady’s . She does not speak English but it was surprising how much I understood and we had a lovely evening . Her finger foods and wine were delicious. Then we flew to Edinburgh , Scotland and that will be another blog so will close tonight. I am still trying to get some pictures in this page, but am not having much success so will go on with the travel and some day will just load the photo in. We travelled to a medieval town deep in a valley, where the water running through was so crystal clear that it was drinkable. The church ensured the survival of the town when some one brought pieces of The Cross to the building. Many shops and alley ways. Later we spied what looked like a castle so Gerry took the road and we went up and up until we came to this small village, no one around except two old women staring at us as we walked around. The castle was off limits, may have been privately owned as looked as if it had had some work done to it. Wasted trip but got our exercise for the day. One day we went to where there are a lot or remains of Roman Roads and abridge. It is a strange feeling to walk on these roads and to imagine the Romans with their chariots going on the same roads as us. It always bothers me to think that these people, who were so clever, terrrific builders and craftsmen, could let their empire fail , especially to people who were ignorant, rough and murderous and took the world into a dark Age. Maybe it should be a lesson to some of the powers today —do not get too sure of yourself ! Finally got a picture frm my trip. This is me sitting in front of the hotel we stayed in in Montellier. I came across this quote and it is what I will be asking people to do as I fumble along with this Blogging business. Tom & I flew to Paris and then on to Montpellier where Gerry & Shoko met us and took us to our hotel, later picked us up and got some food and drove out into the country side for a picnic. It was far from any sign of life, a place that Gerry had discovered on one of his cycling trips . A Roman bridge spanned a valley, but it really didn’t go anywhere. As bridges do not turn me on, I did not walk on it, just sat and watched the others. It is nice to have two guides who know the country and the language, a no stress trip. Our hotel is nice and very central in the old part of the city. From our bedroom window we can watch people come and go from the restaurant across the street. A good first day, looking forward to many more. I did attempt to add a picture but have to do more research on this so maybe the next time I will be successful.